Ordered one for gift and one for myself. Wasn't sure what to expect but they are fantastic! Came super fast and the quality of the mug and photo printing is wonderful. Will definitely be ordering again! This is my second time ordering one of the personalised travel mugs, and I am extremely happy with it. It’s very comfortable to use, the quality of my submitted images came out beautifully, and it is overall a great product. Excellent quality and easy to hang. This was my second order and I am about to purchase my 3rd order. My house will be covered in canvas's. took a little time to get the designing right but once done the result was great - we all love our mugs and all our colleagues are jalouse of them! Second time I've ordered from pixa prints. Everything always high quality and delivery time frame is Amazing. Highly recommend this company for unique high quality products that make great presents. Fantastic product. Extremely happy with the travel mug. The mug itself is fantastic and very cleverly designed. I like the fact that the majority of the body of the mug is a decent size and that the base is sized to fit in a car’s cup holder. The addition of two different sized drinking holes in the lid - not only allows for air to enter while you drink - but gives you the option of taking larger or smaller gulps. In regard to the personalised design, I was very pleased with the professional finish and quality of the photos. The process of designing the personalised section was also very intuitive and easy. Finally, the delivery was extremely quick. I would highly recommend this product to other potential customers. I bought my sister in law a travel mug with a few words and pictures on it. The design process was simple. Very easy. Once I ordered I received updates to the status of my order as soon as it happened in real time. Never experienced anything as professional while shopping online. From ordering to manufacturing to shipping the status was updated immediately every time. Impressive. The quality of the product from travel mug to quality of the product to spot one. Way better than I expected. Would be very happy to recommend Pixa Print and won't hesitate to use them again. This was a gift so I didn't actually use it but the design was exactly as expected. Good quality and the photos turn out well. Never fails! Great photo quality, and so so quick! I ordered the personalised travel mug and it turned out perfect. The photo uploaded was from my phone but it came out so clear. Great product and arrived very fast in excellent condition. Easy to design your own cup. Great quality, looks fabulous! Really love it. Such a great gift idea. Delivery was super fast I think. Beautiful travel mug, makes a lovely present. Very fast to deliver. Have already been asked to send details of where I got this done. Expect more orders. Great product. Keeps drinks really hot. Easy to clean. The quality of the pictures printed is excellent. Really love it. Fab personalised travel mug! Really great quality! Superb, fast delivery...would recommend and will definitely use again! Really happy with the travel mug. The quality of the photos on the cup was very good also. I received my order within three days of ordering, very happy with the fast service. Review by: Anne Marie D.
Really fast delivery. Picture quality is perfect. It hasn't been tried as a travel mug yet! I bought the 12 photo travel mug. Whole process was user friendly. Delivery was speedy and quality was great. Great product, really happy with it, so easy upload the photos etc and make your own design on-line. very good communication via email with regard to status of the product. Amazing quality product, faster then fast delivery-couldn't be happier! Thanks a lot! Absolutely blown away with the service I received from pixaprints (you can ask the girls I work with coz I have been singing their praises!) Was kept informed the whole time of my order status and still cannot believe how quickly I received the goods!! Excellent quality! Cannot recommend highly enough! I only discovered Pixaprints.ie from a random Google Search and I am beyond thrilled with the service!! 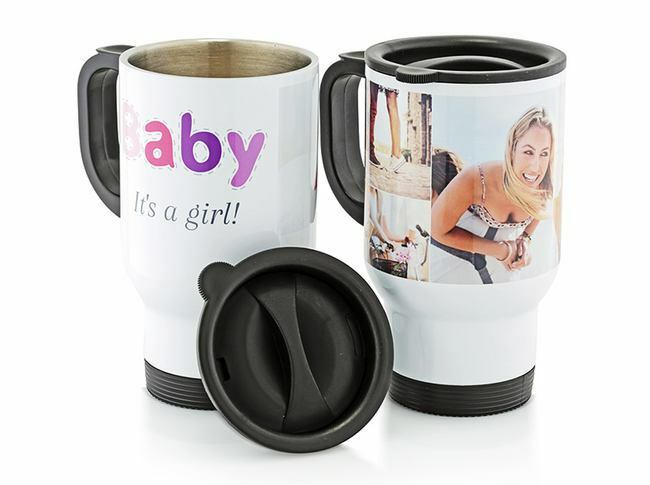 I was looking for a personalised travel mug and I found exactly what I wanted. I uploaded three images and picked a design and although I didn't expect much cause the price was so affordable, I am beyond thrilled with the outcome. I ordered my Travel Mug on a Monday and Received it on Tuesday. Amazing!! I received email updates about the progress of my order which was very professional. The quality of the pictures on the mug is exceptional!! I am beyond happy with my purchase and I couldn't recommend PixPrints.ie More Highly! !